Its still possible to dig out 3 – 4 year old mobile phones and sell them on recycling sites for as much as £50 – £70 each or even more. All you need to find is the handset itself, don’t worry about the box, charger or accessories as they aren’t needed to sell online. Even if you find an old broken mobile phone its still possible to get some cash for it. Finding the best price for your old mobile has become easier due to sites launching comparison tools. You can use our comparison tool which is found to the right of the home page on Sell Old Mobile Phone here. Simply select the make and model of the phone you want to sell and you will be quoted the best prices in the window that pops up, click on the recycler that you want to sell at and you will be redirected to their site. 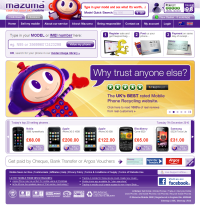 One of the UKs biggest recycling companies, Mazuma Mobile have paid out £68 million to their customers since launching 3 years ago. They say that not all old mobile phones are ending up in developing countries, some are sold off to insurance or mobile companies in the UK to replace lost or stolen handsets. Some of the phones that are sent in are even sold to wholesalers who sell them off as refurbished handsets. All mobiles that are sent in are checked against a database of lost and stolen phones. If a phone is found to be lost or stolen then it will be recycled and the police will be informed. To get the most money for your old mobiles always check the prices on each recycling site before deciding who to sell to. Always check the payment methods and see how quick the recycling site can get your money too you and lastly have a glance over the terms and conditions. If you are selling a non-working handset check through the terms and conditions or frequently asked questions to see how each company actually defines a broken phone. If your mobile is heavily scratched or damaged you may find that a lot of money is deducted from the original price. 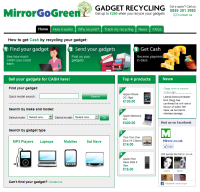 Not only can you recycle old mobile phones but some online recyclers such as MirrorGoGreen now do gadget recycling too and will buy your old laptops, SAT NAVS, digital cameras, iPods and iPhones for cash via cheque or BACS.